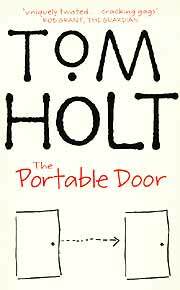 The Portable Door was released this year in paperback (ISBN 1-84149-208-6, Orbit Press) and was written by Tom Holt. This author, a one-time solicitor, would have to be one of the most prolific writers on the planet, with 32 titles to his credit in a time frame of nine years, if one believes his publisher’s notes. The book begins with the hero waiting for a job interview, and author Holt lets you know immediately that the main character, Paul Carpenter, is no Indiana Jones, but rather an introspective loser tending towards paranoia. He is the person whose biro pen always runs out before he is one third of the way through signing his name. Ineptness mastered as an art form. The book revolves around Paul Carpenter’s new job in a rather strange dusty office, which by half way through the book has become inhabited by goblins, who seem to be a cross between the strange humanoid thing in Lord of the Rings and Bugs Bunny. By this stage I was a strange cross between a reviewer and someone about to throw the book at the wall. I have to admit I am not into goblins. By two thirds of the way through I was caught up in a strange supernatural thriller which becomes more and more weird with every turned page. Consequence Mines, Probability Wells and Groundhog-Day Loops leap off the pages and attempt to drag you into bizarre vortices to the next world. For any of you who have had the (mis)fortune to see the National Groundhog Day movie, this book was rapidly becoming the print version. However, it was heartening to see that in this world there is a solicitor with a sense of humour. It is not surprising that he traded in his torts for a word processor. This book is not one of those “can’t put it down” types of reads, but can easily be put down and picked up again as the book has humour, which it delivers all the way. If you liked Lord of the Rings you may understand this book. It is a sort of compote of thriller, comedy and who-dunnit or a Harry Potter at the psychiatrists. You will be glad to know that the long stapler finally is revealed and everybody hated the photocopier. Too weird for me! The review copy was made available by Bookazine, but it should be available at all good bookstores. It had an RRP of B. 395, which makes it inexpensive for a paperback, but not my cup of hob-goblin tea, even with a portable door. It is only April, but Mott the Dog knows already what is going to be his CD of the year. 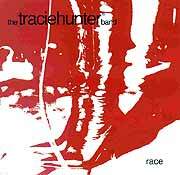 Yes, it has to be the latest release, ‘Race’ from the Tracie Hunter Band. This is actually the band’s first full-length release, and it will completely blow away all the cobwebs in your speakers - if not blow away your speakers all together. The band pulls no punches on all of the eleven tracks that have been laid down; there are certainly no filler tracks here. The lineup of the band has now been stable for over a year, and know each other well. This comes across on the songs as each is played with the tightness of the English Rugby front row, and with the fire and passion of the England Cricket team’s new pace attack. Tracie Hunter herself has grown into a fine front person, and her vocals are quite superb throughout this album. Surely she must be the finest Lady vocalist on the present rock market. If you have any doubts, one listen to ‘Race’ is enough to make you agree with me. The way Tracie Hunter delivers the throwaway line, “This isn’t really Rock ‘n’ Roll” in the middle of the last single ‘Maybe’, is defining and a delight to hear. Tracie also has a hand in writing all of the eleven songs and so does guitarist Neil Gabbitas. With the release of this album, he will be put at the top of the new wave of guitar heroes. Neil Gabbitas wrenches every bit of emotion from the strings of his axe, and nails each solo to the mast to fly proudly. Joining Neil Gabbitas on guitar is Matt Pearce, and when these two are blazing away with both guns, you know this really is rock and roll. On bass guitar is Neil’s brother Mel, who, as well as laying down some really heavy bass lines (it would actually be Mel’s playing that will blow your bins away), he also handles all the production and mixing work with a little help from his brother and the Lady out the front. And this is where the songs really excel. The sound is crystal clear, the mixing on opening song ‘Like You’ leaves you in no doubt that they have been laid down by somebody who has loved and treasured them. Steve Washington drives the band along from behind his drum kit, and Darren Oldale is on the Bvs. Opening song ‘Like You’ begins with some guitar scapes before the rest of the band come thundering in and, over its nearly 5-minute length, builds to a frenzied climax, in a way reminiscent of The Sensational Alex Harvey Band’s ‘Faith Healer’, which always opened up their live set. ‘Faith Healer’ was one of the greatest openings to any set of rock ‘n’ roll, so this draws a favorable comparison. ‘Lost Inside You’ is a glorious acoustic ballad, a little bit retro. But is there anything wrong with that? It shows off Tracie Hunter’s vocals perfectly and Neil Gabbitas’s gentler side, as his acoustic guitar is the only backing for Tracie Hunter’s voice. It is hard to single out any particular track for shining a spotlight on, as they are a fine collection of diamonds here. ‘Maybe’ is an instant classic and will presumably be in the live set for eternity, as ‘All The Young Dudes’ will always be in her father’s set. The title song is particularly moving. “This ain’t a race of Life, This ain’t a race of time, It’s about everything about nothing”. ‘Astoria Morning’ brings the set to a fitting finale, leaving you with only one choice: to push the repeat button on your CD and listen to Tracie Hunter and her band again. The album cover has got to be the reddest artwork ever, very eye catching, and Pattaya socialite Colin Powell gets a name check on the inside, too, which is nice. Is this collection of songs worth blowing up your speakers? Of course it is, you know it makes sense. Catch the Tracie Hunter Band now, at the beginning of their recording career, and cling on for a rocket ride.